These emerald islands with crystal clear blue waters, white sandy beaches and luxurient forests with unique biodiverstiy both terrestrial and marine are a paradise for tourists. A & N Administration is giving a high priority to promotion of eco-tourism in these islands. Some of the important places of interest to tourists, scientists, researchers and students are described here. Mahatma Gandhi Marine National Park established in 1983, is one of the most important areas for viewing marine diversity. 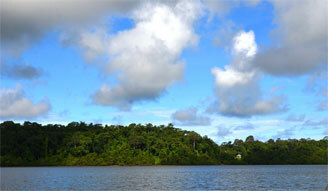 It is situated at Wandoor, 29 km from Port Blair. Total area of this Marine National Park is 281.50 sq.km. which includes 220 sq.km. of territorial sea water. There are 15 small and large islands in the Park with beautiful sandy beaches and creeks full of lush green Mangroves and tropical forests. Rich marine life consists of variety of coral reefs, colourful fishes, molluscs, shells, starfish, turtles, salt-water crocodile etc. One can also view a variety of birds like White-Bellied Sea Eagle, Andaman Teal, Reef Heron, Terns, Parakeets, Waders, Swifts etc. Some of the important islands rich in coral diversity are Jollybuoy, Redskin, Grub and Chester. State transport buses and private buses/taxi ply regularly between Port Blair and Wandoor. In the Marine Park, authorised tour operators provide boat facility for visit to Jolly buoy and Redskin Islands. This sanctuary is spread over 5.82 sq.km. on Eastern Coast of Middle Andaman Islands. It is having splendid beach which is used by sea turtles viz. 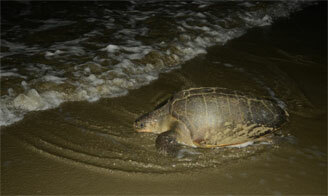 Green sea turtle, Leather back turtle and Olive ridley for nesting. These two islands are situated on the eastern side of North Andaman Island and are known for their beautiful sandy beaches and crystal clear waters. The beaches are one of the turtle nesting sites for marine turtles. 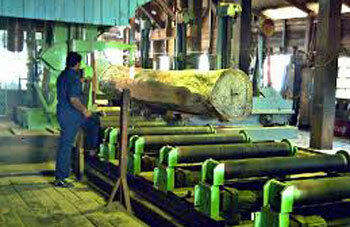 This saw mill is one of the largest saw mill in South East Asia. 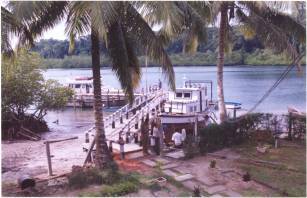 It is a popular tourist destination in Port Blair. This National Park is spread over 32.54 sq.km. and is situated in North Andaman Island. This Park is known for unique terrestrial flora and fauna. This National Park is spread over 110 sq.km. in Great Nicobar Island and is important for conservation of Megapode, Giant Robber crab, Nicobar pigeon and other important fauna. This National Park is spread over 426 sq.km. in northern part of Great Nicobar Island and is known for its tropical evergreen forests, tree fern, ground orchids and among fauna for Crab eating macaque, Giant Robber crab, Megapode, Nicobar Pigeon etc. This sanctuary is located south of Rutland Island and is spread over an area of 9.51 Sq.Km. It is known for beautiful beaches and coral reefs. This sanctuary is spread over 100 sq.km. and is situated north of Marine National Park Wandoor in South Andaman Island. As this sanctuary mainly comprises of creeks it offers and excellent habitat of salt water crocodile. This island is situated north of Interview Island and entire island having an area of 1.74 sq.km. is a sanctuary. This sanctuary is an excellent habitat for Andaman grey teal and Littoral waters harbour rich variety of coral reefs and other associated marine fauna. This Biosphere Reserve is constituted under Man and Biosphere Programme of Govt. of India. It incorporates Galathea National Park and Campbell Bay National Park and is spread over an area of 885 sq.km. This Biosphere Reserve is known for its unique bio-diversity and harbours rich genetic germplasm resources. The forest museum is located at Haddo and exhibits various timbers species and other forest produce of ecological and commercial importance. The mini-zoo is located next to PCCF's Office at Haddo. It exhibits unique animal species which are found in these islands. This National Park is spread over 46.62 sq.km. and is known for prestine tropical evergreen forests and for some of the endemic reptiles and amphibians. 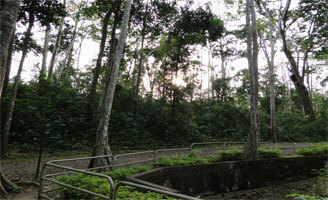 Daily bus services are available from Andaman Teal House to this park . The Entire Island having an area of 6.81 sq.km. 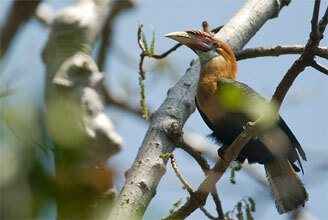 is declared a sanctuary and is the only abode of Narcondum Hornbill. The entire island having an area of 133 sq.km. 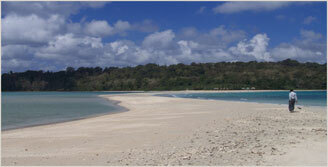 is declared a sanctuary and is situated north-west edge of Middle Andaman Island. This sanctuary is known for its feral elephants. There are more than seventy elephants in this sanctuary. This island is known for its luxuriant tropical evergreen forests, natural water Green streams and endemic fauna like Andaman teal, imperial pigeon etc. The beaches of this island are one of the important nesting grounds for marine turtles in this island. An Eco-awareness generation project is being implemented by the Administration in this island. A Biological Park is developed at Chidiyatapu for housing and exhibiting animals with the objective of educating people, ex-situ conservation and captive breeding of rare and endemic fauna of these islands.